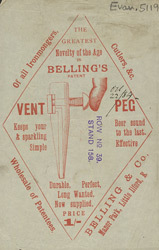 This is an advertisement for Belling’s vent peg. Brewing became a science in the 19th century, technological developments meant that the various blending and boiling processes were properly understood for the first time. This meant that much more beer, stout, ale and porter was produced than ever before. Novelties like Belling’s vent peg were very popular because they helped the liquid to stay fresh in the barrels before it was poured.